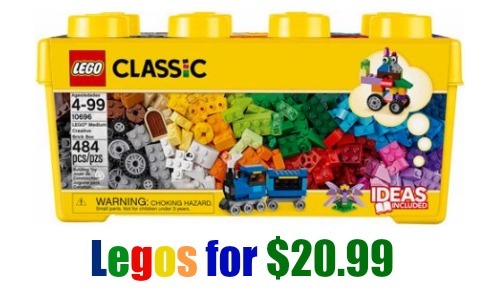 If Legos are on your shopping list, don’t miss the LEGO Classic Medium Creative Brick Box for $20.99, regularly $39.99. This box includes 484 pieces with LEGO bricks in 35 different colors plus 18 tires and 18 wheel rims, a green 8cm x 16cm baseplate, window with frame and 3 sets of eyes! You can find this deal at Target or Walmart, but keep in kinds that you can get $10 off $50 or $25 off a $100 toy purchase at Target through 12/17, no coupon code needed. Offer valid 12/13 at Target.